Contains: One syringe (2 mL; 3.4 g) ONLY. G-aenial Flo is a partner product to G-aenial Universal Flo. It is indicated for use in small cavities, serving as a cavity liner. This highly radiopaque and flowable composite enables easy placement and flow during handling preparation. 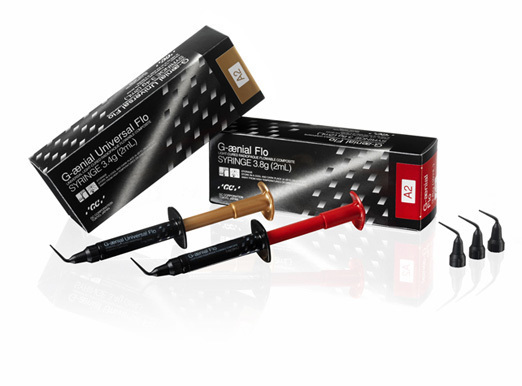 G-aenial Universal Flo represents the next advancement in the flowable composites category. In the past, dentists had to sacrifice strength and aesthetics to get the easy handling they loved with a flowable. That is no longer the case. Studies have confirmed that G-aenial Universal Flo has higher strength, higher wear resistance, and higher gloss retention than other tested flowable composites; it even rivals leading conventional composites in these categories. Finally - no more sacrifices to receive the handling professionals love!